This king wanted to reconcile the French. Notably by transforming the palace of Ancien Régime into a museum open to all and dedicated to “all the glories of France”. Versailles does not forget the most prestigious of its guides, Louis-Philippe. 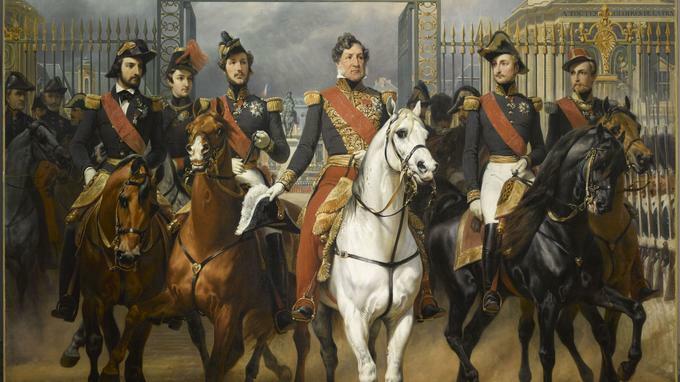 As an introduction to an exhibition putting back on the saddle this “forgotten king” (Dixit Michelet), in a painting signed Horace Vernet, it is he who, bicorne low, welcomes us. He wished to be figured thus, at the entrance of the castle, on horseback and in front of the equestrian statue of Louis XIV the revered grandfather, although indirect. Being both a continuator and a man of his time, this Louis-Philippe has obviously nothing to do with the famous caricatures of him in the shape of a pear that have caused much trouble to their authors Philippon and Daumier . They have not even been included in the windows. Suffice to say that this Versailles asleep since the Revolution, the Bourbon intends to give it a maximum of luster. This while opening it to all. For this son of the regicide Philippe Égalité wanted more “king of the French” than King of France. Important nuance. Moreover, brought to the throne by the revolution of 1830, driven by that of 1848, he embodies the contradictions of our country; that still today. Versailles rehabilitates it with this exhibition installed in its richly painted walls of the north wing. Precisely in the rooms glorifying the colonial conquests of the Maghreb led by one of his sons, the Duke of Aumale. The journey marries life and action, but focuses on one of the most important policies of the kingdom: tending to the reconciliation of the French by a linear reading of history, of course fully dedicated to the justification of the power in place. We first discover a well educated prince, who has good taste (Girodet, Winterhalter, Géricault, modern furniture and inventions), a soldier who actively participated in the revolutionary battles (Valmy, Jemmapes). Then from the Terror and during a long exile (Switzerland, Sicily, England), the future Louis-Philippe ran other adventures, crisscrossing the North Cape, North America, Cuba or the Bahamas. Past these reminders, place is largely made to the transformations of the palace of Ancien Régime. When many of the most noble apartments have been transformed into a museum of French history dedicated “to all its glory”. The plans in section, large formats meticulously detailed and delicately watercolored by the architect Frédéric Nepveu, make here wonder. With these documents, 32 pieces are reproduced, a succession of statues and illustrious busts, galleries of battles and deeds, from the legendary election of King Pharamond by the Franks to the capture of Abd el’s smalah. -Kader depicted by Vernet in a panoramic and Hollywood way (21 meters long!). Most of these spaces were inaugurated in 1837. And most have recently been restored. Usually not very accessible, they can be traveled freely. So we recommend to discover them, or to survey them again, in the wake of the exhibition. But then have a good half day and plan for good shoes. For the least hikers the course stricto sensu (already seen by nearly 450,000 people) ends with the letter of abdication and the office of Louis Philippe at the Tuileries. He keeps the mark of the rioters who forced him. NEXT POST Next post: Old Man Didn’t Even Flinch When The Devil Appeared Before Him.